So many things to see! 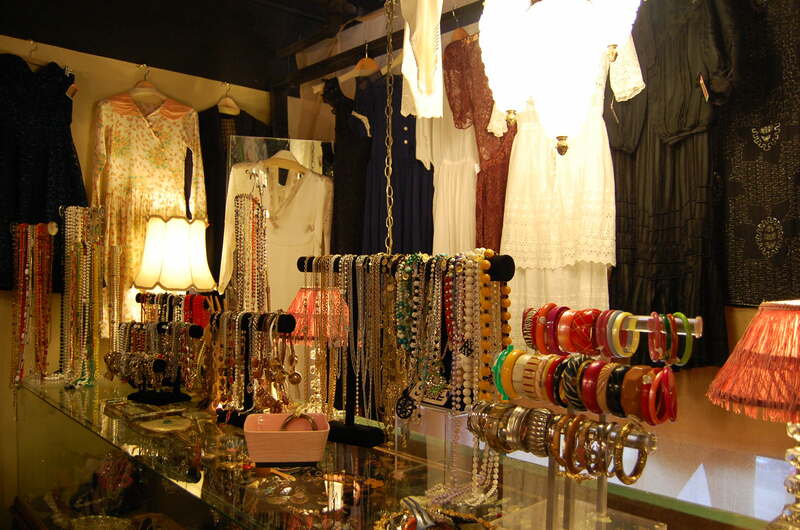 The brochures include vintage culture and nightlife spots in addition to vintage clothing stores. 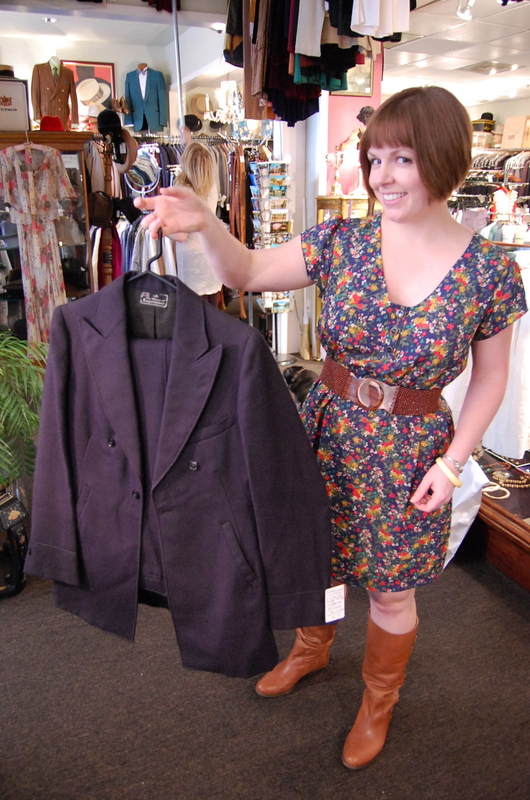 Just when I was beginning to think eBay is the only place I’ll ever find a deal on vintage clothing or find, not just one rare gem, but hundreds of fantastic items, I travel to Portland, Oregon for a day of vintage shopping. 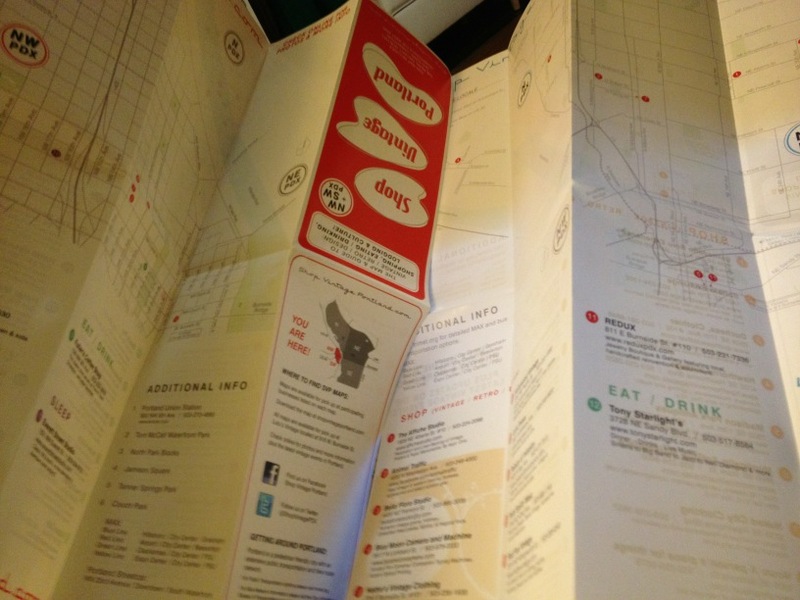 Oh, Portland…your stores are so numerous that they fill up two brochures with maps of locations! I’ve been saving this post for Yehoodi because I knew it would be full of extra goodness, hence the delay in posting following my trip to Portland, Oregon a few weeks ago. 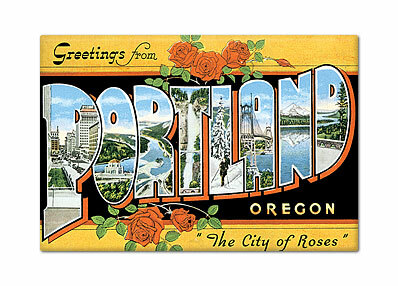 I should begin the story of my trip to Portland with an Etsy purchase from Jitterbuggin’(aka Kim Cullins), about a week before my trip. 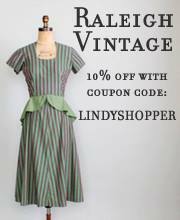 I noticed that her logo included her location, which happened to be Portland, and I thought, who better to give advice about what vintage stores I should check out in the city than someone who lives there and makes reproduction vintage garments? 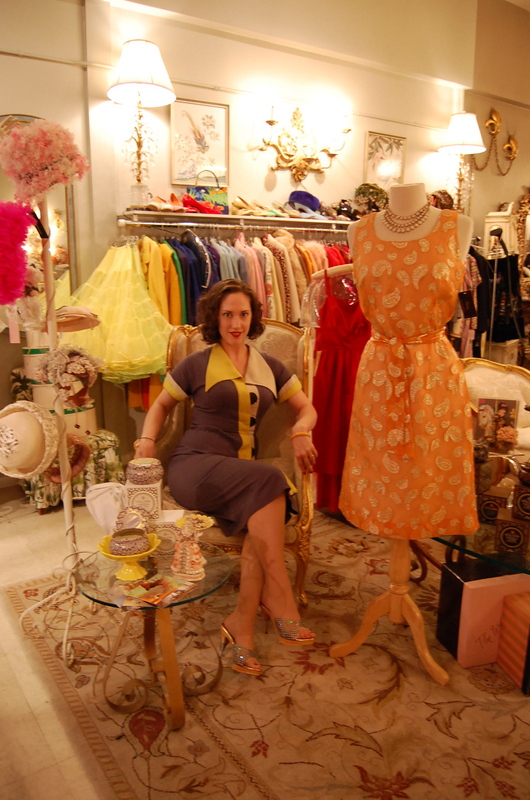 So I sent her a private message asking about vintage shopping, to which she responded “You should call me and I’ll meet you out for a shopping date.” Um…yeah!!! So what makes two strangers from opposite sides of the continent able to meet up and share an afternoon of shopping? 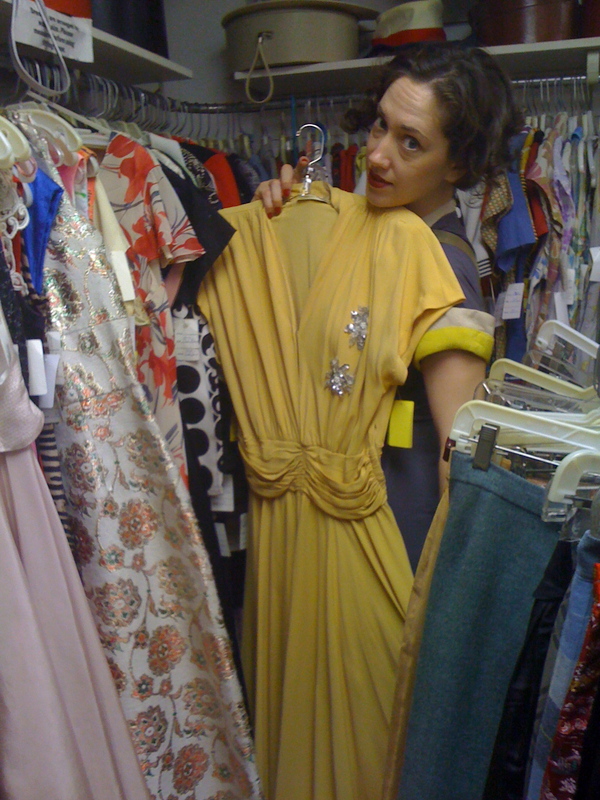 Two things: vintage clothing and swing dancing. 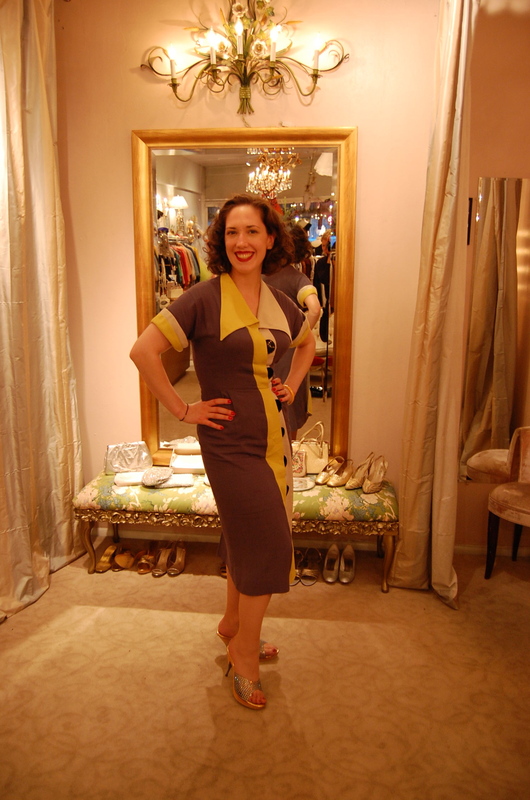 Thanks to the Interwebs, our continents grow smaller and communities grow larger, and the friendly faces of the swing dance community, like Kim’s, open up opportunities in other cities that don’t seem to exist for people outside of our community. My purpose in Portland was to visit my dear friend from college, Danielle McQueen, and have fun with her in Portland, while incidentally accomplishing some planning for her wedding. 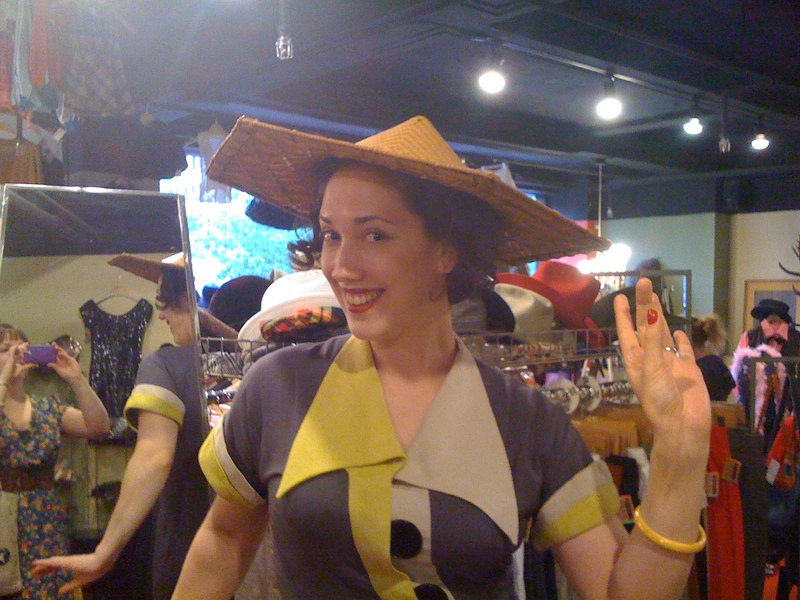 Part of the planned fun was already to go vintage shopping, so Kim’s offer seemed like the cherry on our plans sundae. 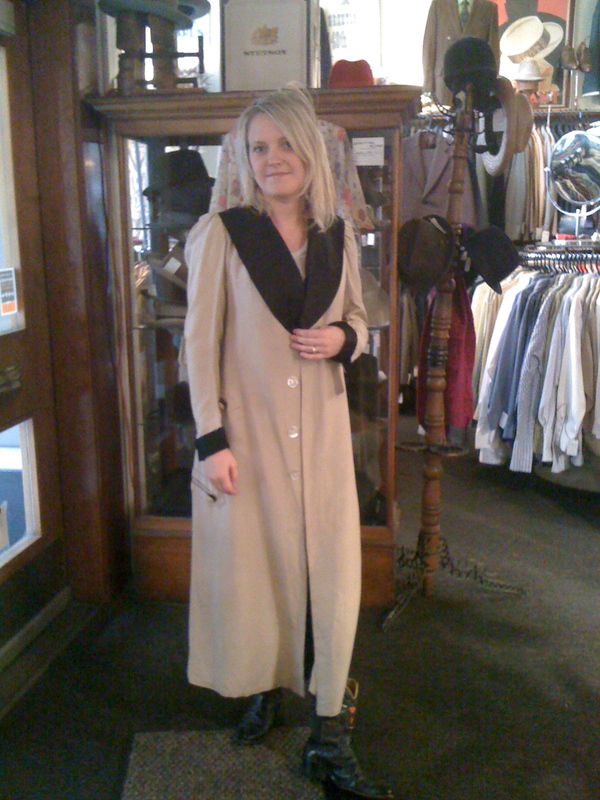 At Kim’s suggestion, we met her at Huber’s, a restaurant that has been in business since 1879 and has the distinction of being Portland’s oldest restaurant. The restaurant had a lovely Victorian interior and specialized in “a traditional turkey dinner” (hello turkey pot pie! ), as well as coffees…but not just any coffees. Their signature cocktail is a Spanish coffee, which the menu states is “Kahlua, Bacardi 151, Bols triple sec and coffee topped with fresh whipped cream and nutmeg, flamed tableside.” You read that right – FLAMED TABLESIDE. Kim ordered a Spanish coffee and, having not seen the menu, had no idea what was going on when the bartender brought over a tray with all the ingredients to make the cocktail. There were grand pours of liquor, with a span of almost four feet, followed by a flame to caramelize the sugared rim of the glass, then more grand pours, and the topping of freshly whipped cream and sprinkles of nutmeg. It tasted so divine, I wish I had ordered one of my own! After lunch, we embarked on our shopping trip. 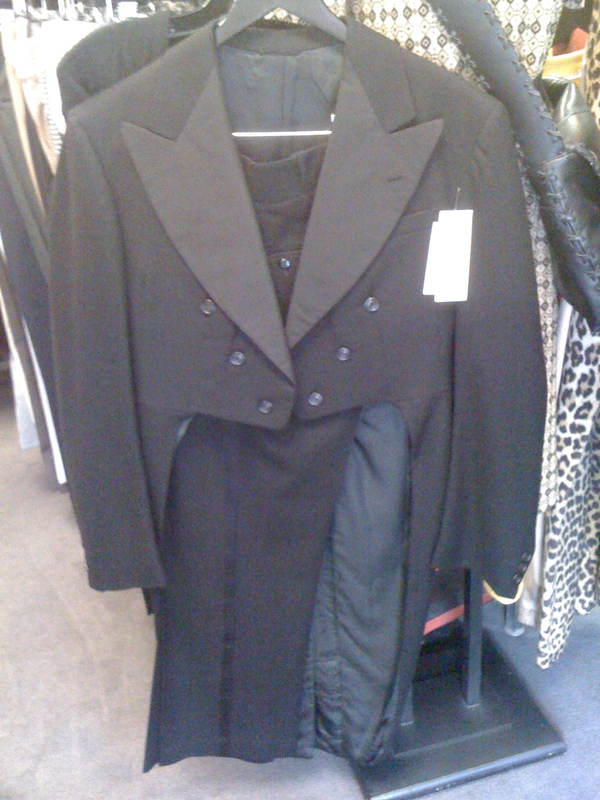 The first stop, Decades Vintage Company, was just around the corner from Huber’s. 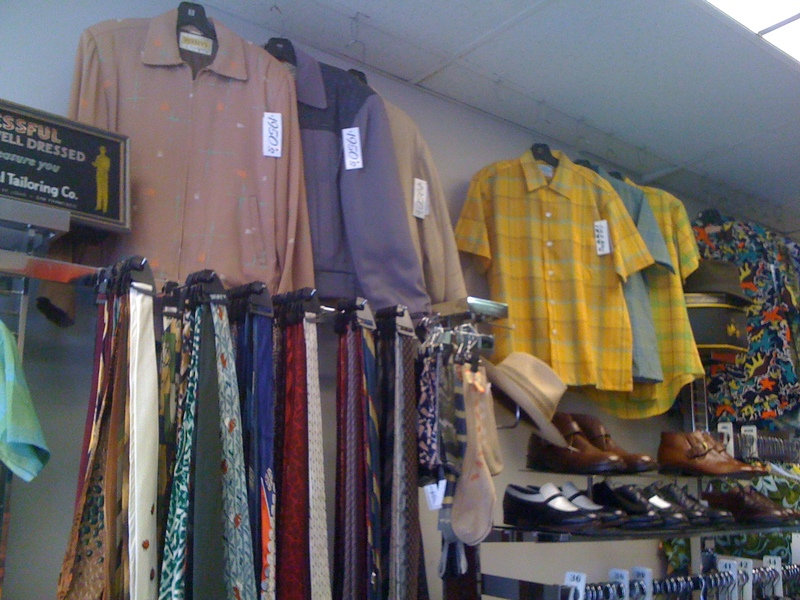 The store was small, but inviting, with a lot of great menswear pieces and an enviable rack of shoes in the back of the store. 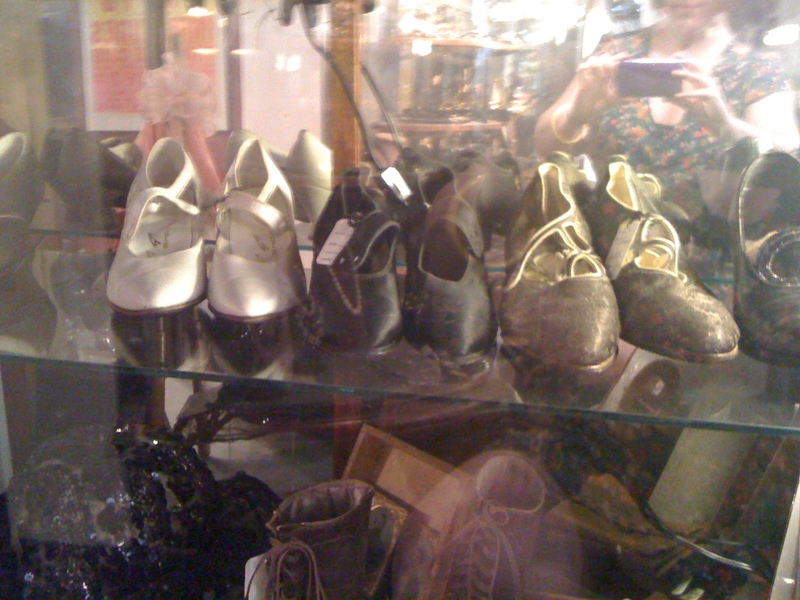 There was much lingering around the shoes and we began talking about the vintage shoes we longed for. 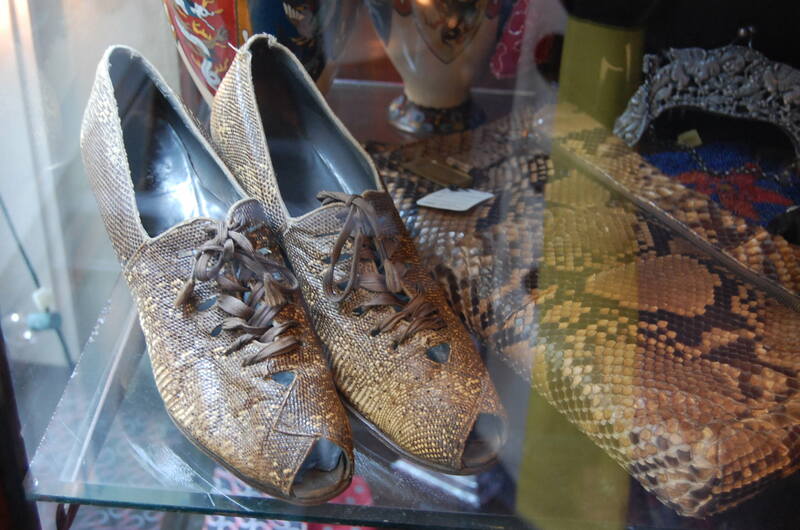 I began to tell the story of how my grandmother danced a hole through a pair of red snakeskin heels in one night, to the dismay of her family who had scrimped and saved ration coupons to buy her those fancy heels, and how I wanted just such a pair. 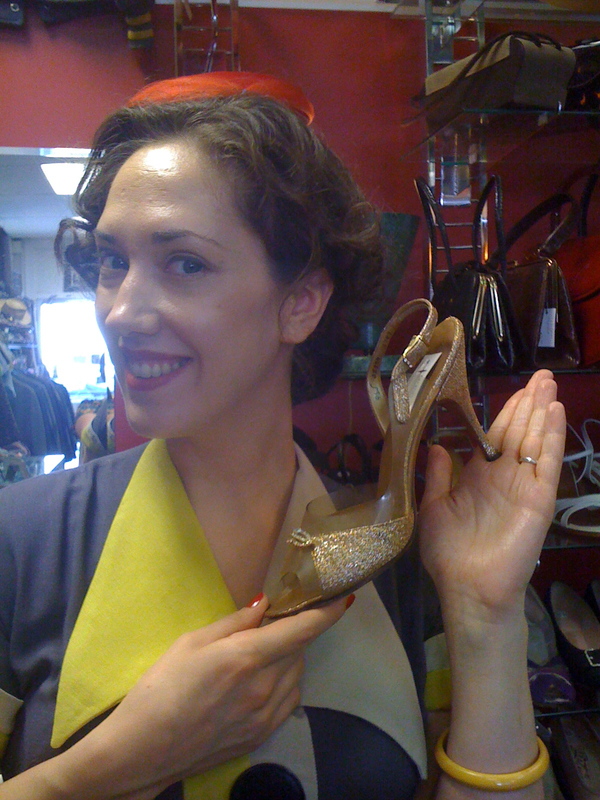 At that moment one of my companions gasped and we all turned around to look at the shop owner, who had discreetly pulled out a pair of red 1940’s heels from behind the counter and placed them on top of the counter while I was telling this story. Were they my size? You bet they were! 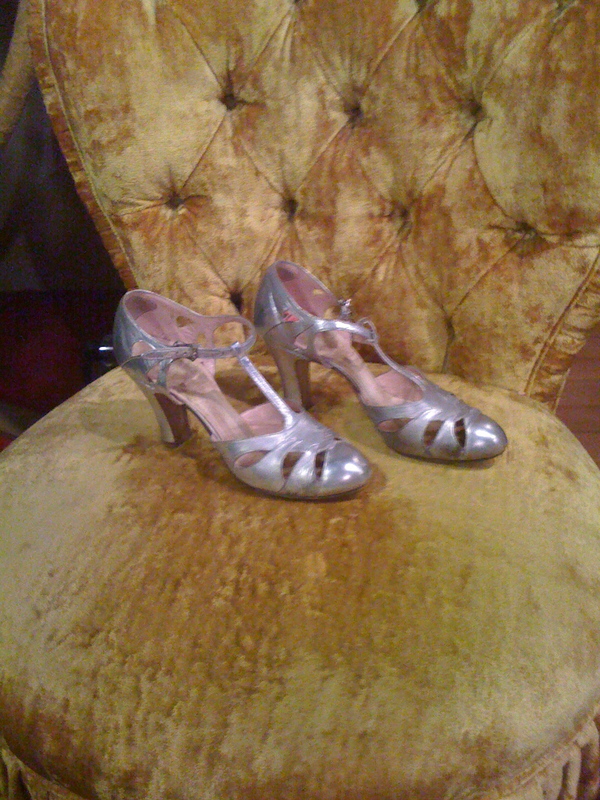 I left Decades Vintage Company with a very happy shoe purchase. 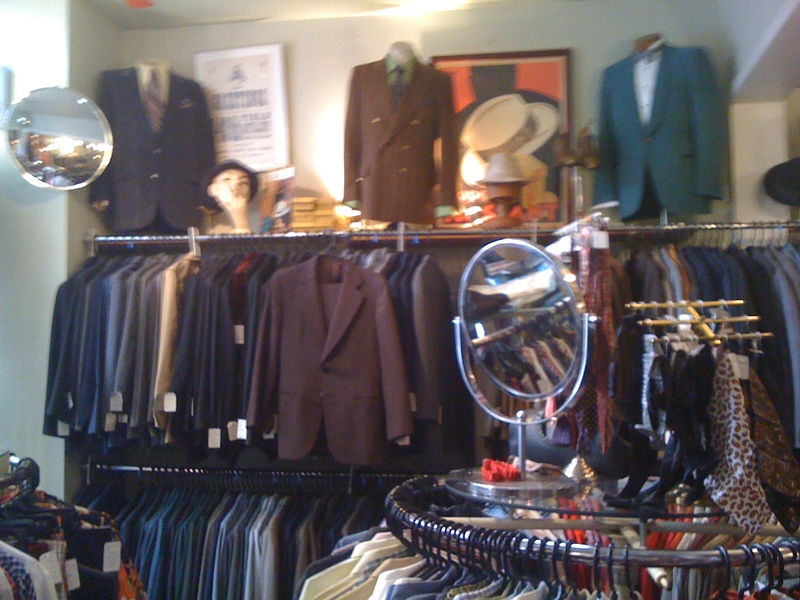 Nearby was Avalon Antiques & Vintage Clothes, a large vintage store with museum-like displays of early 1900’s clothing at the front of the store and an entire wall of men’s suits that made it feel a bit like a vintage version of the Men’s Wearhouse. 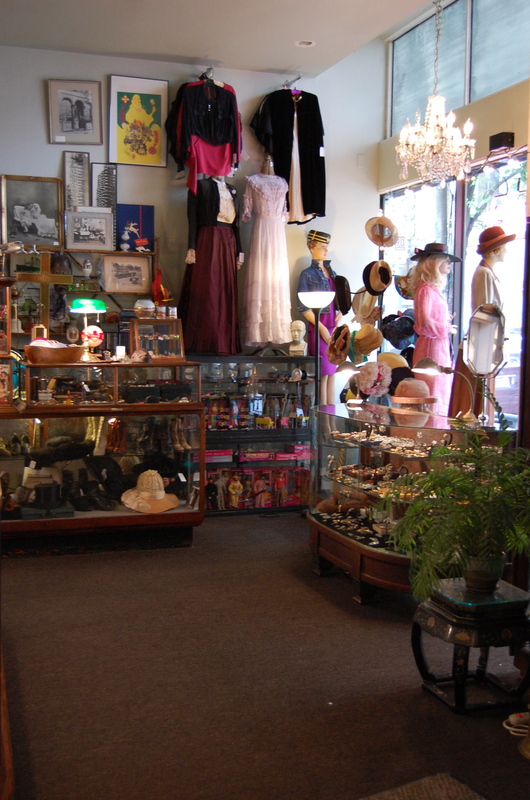 It took a while to take in all the awesome things on display at the front of the store, like 1920’s shoes and Victorian accessories, but I slowly made my way around the store. 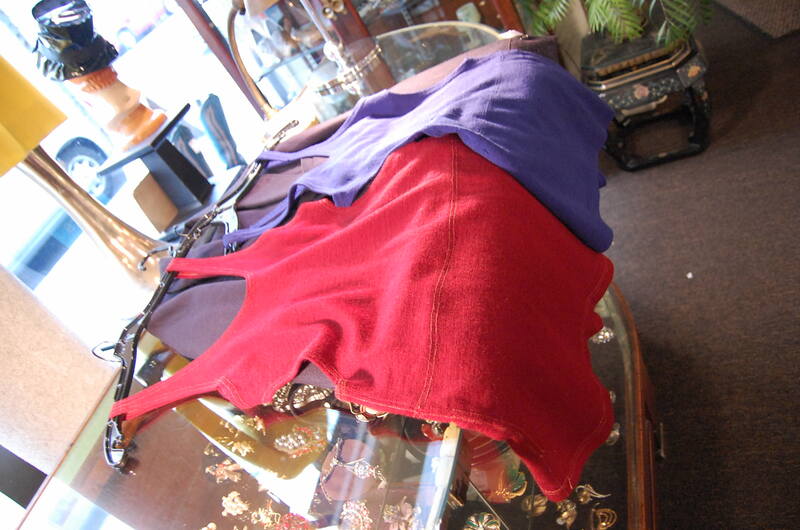 After going through the racks, I noticed I wasn’t encountering any pre-1940’s clothing – where was the good stuff? 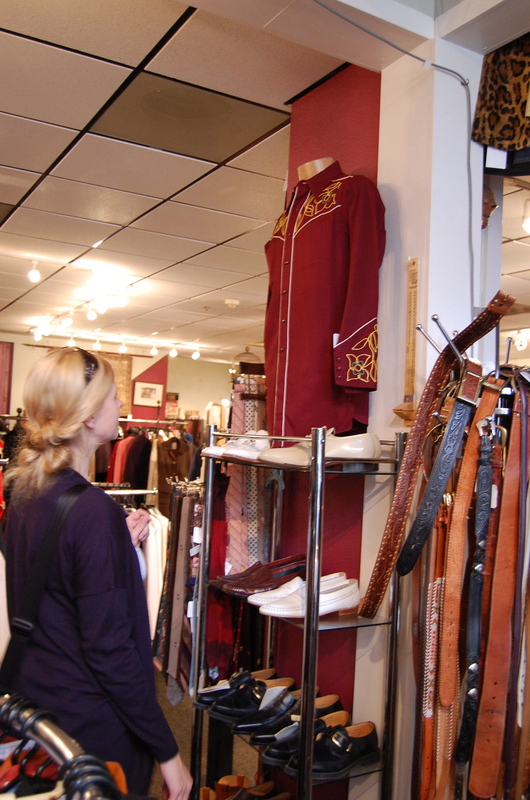 Kim pointed toward the ceiling, where there was a rack full of delicacies from the decades I love, plus some even older items. 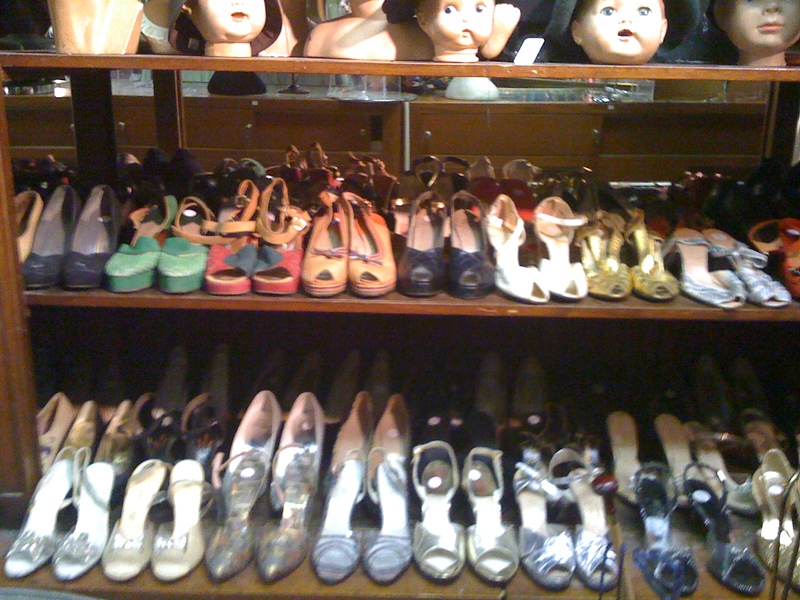 Introductions were necessary at this point to gain access to the rarities on the ceiling, so between the Lindy Shopper blog and Kim’s reproduction business, we had enough credibility to get some of the garments off the ceiling rack. 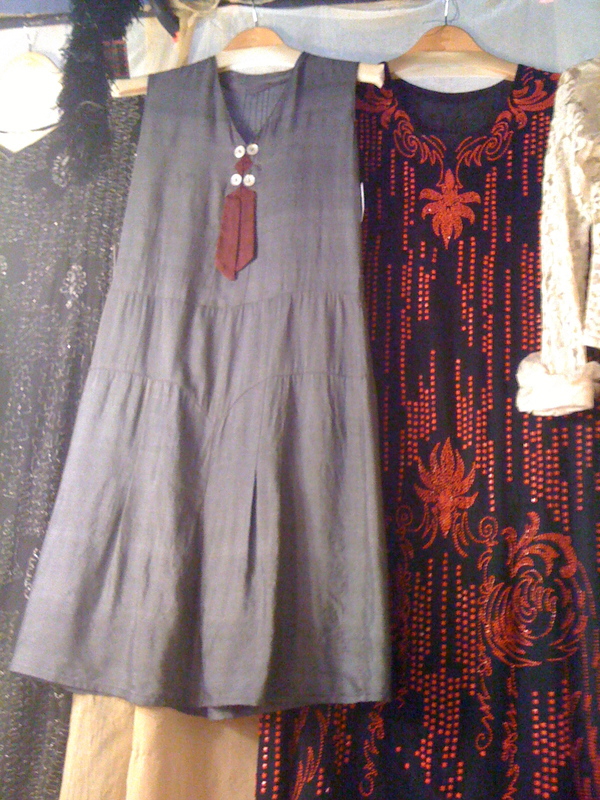 The shopkeepers shared some wonderful treasures with us from the top rack and the mutual appreciation and joy for these garments was evident, as they continued to pull down things for us to admire – a 1920’s neglige, a spring green silk 1920’s dress, a gossamer 1930’s dress with matching jacket, a Titanic-era coat, and 1920’s day and evening-wear. 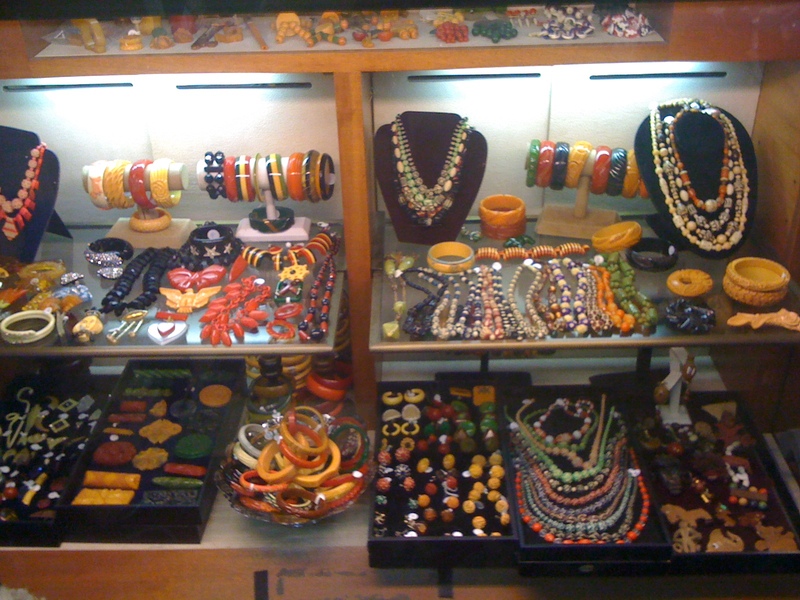 While we didn’t leave with anything, we did have a wonderful experience in this store. 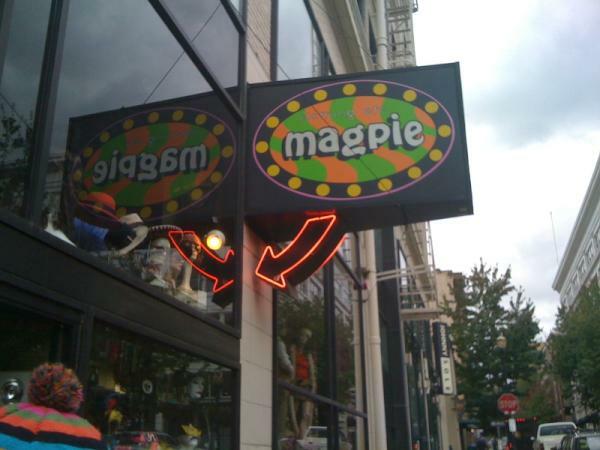 Next stop was Magpie, an equally large vintage store, but with a more eclectic and modern selection. 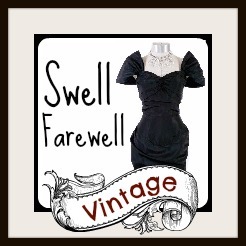 Even so, there were some choice jazz age and swing era finds, like some divine suits, a sheer 1930’s day dress, silver t-strap heels, 1920’s day and evening-wear, bakelite accessories, vintage luggage, and hats. 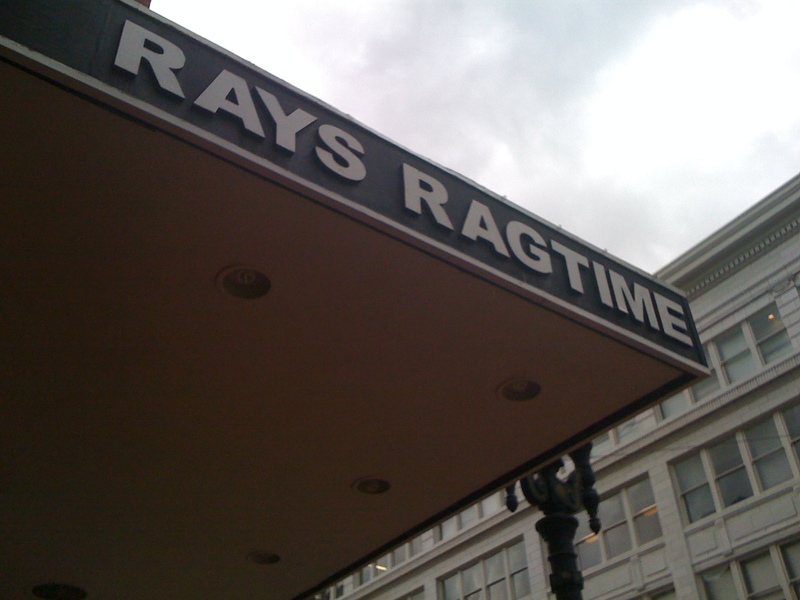 Ray huffed, then turned around and continued working on something. 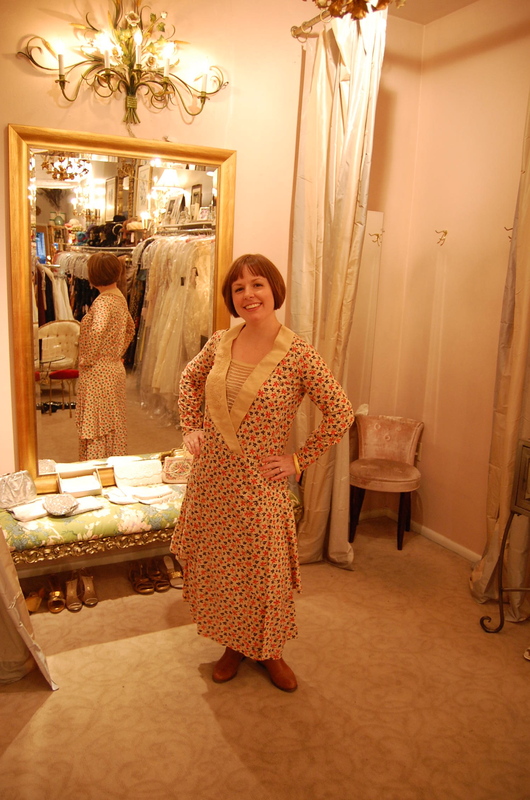 He then turned back around, got a long pole, and fished out an orange and tan 1920’s dress from one of the ceiling racks. Orange is probably the last color I would wear with my coloring and before I could articulate my thanks for him pulling it down, he says again “well, I guess that’s not good enough for you!” I muttered my thanks, paid for my bakelite, and we ran out the door to wretch and moan on the sidewalk about our awful experience. 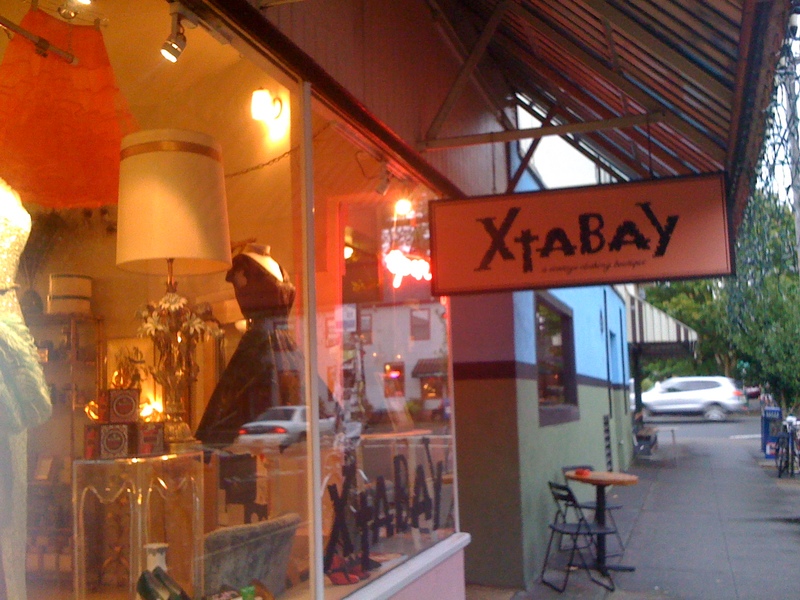 We needed a palette cleanser after that bitter pill, and, thankfully, our next and last stop for the day was Xtabay Vintage Clothing Boutique, a vintage shop with decor that looked like a cross between an elegant ladies shop and a Hollywood Regency boudoir. Calm and elegant was just what we needed, as well as the friendly chatter with Xtabay’s employees and owner. 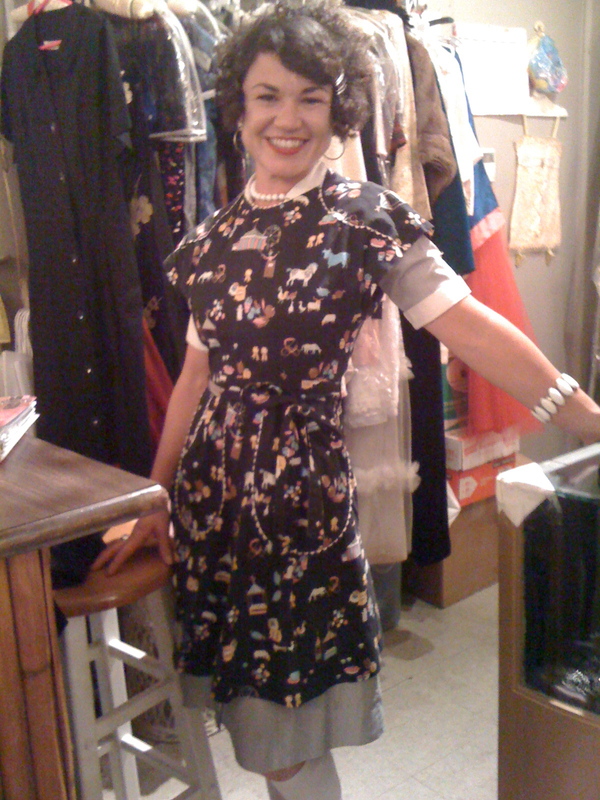 I found an “almost” with a 1920’s dress, but would have had to modify the garment too much for my purposes and didn’t want to hurt the integrity of the garment. 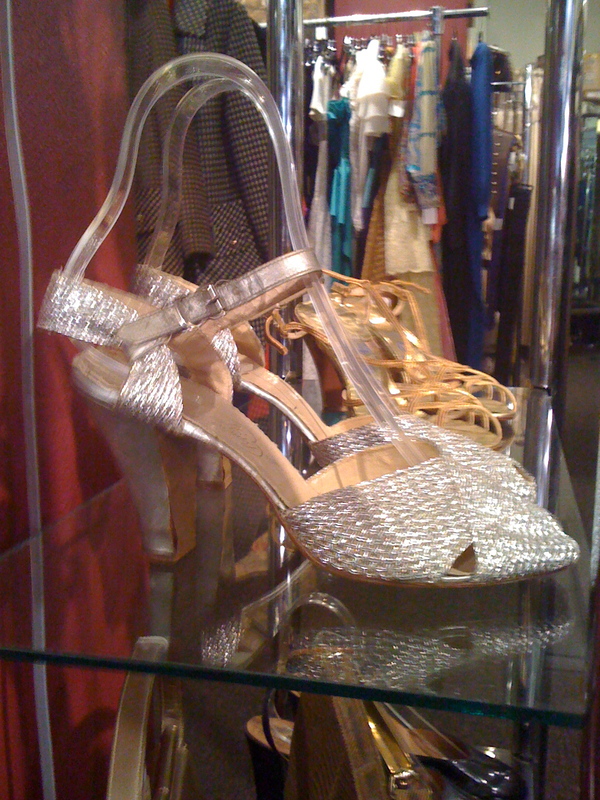 Kim found the most amazing 1950’s shoes with little crystals/rhinestones all over the toe strap and saucy gold metal heels. 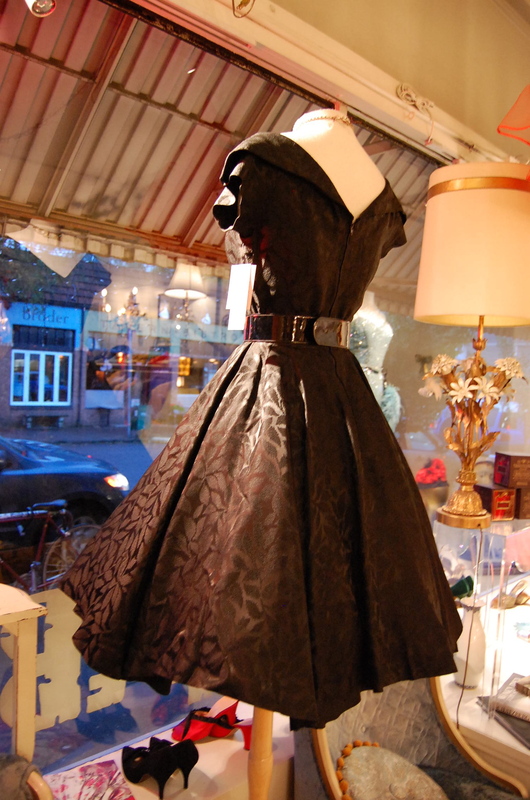 There were some really great 1950’s party dresses, vintage suits, dresses made with wonderful novelty fabrics, and some seriously hot shoes at this store. 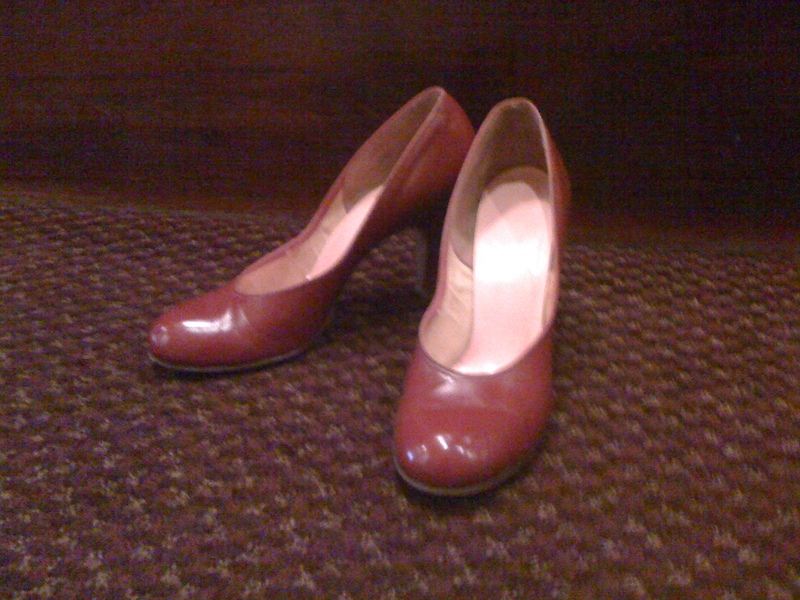 The red heels from Decades Vintage! Croc shoes and matching bag at Avalon - 1940's?